When you need to make a great first impression, whether for an important meeting or on a first date, you can’t go wrong with a freshly pressed shirt. The trouble is, achieving this perfectly ironed shirt at home can be tricky and unless you plan to outsource this part of your laundry you’d better pay attention to this guide on the right way to iron your shirt. Getting prepared is half the battle. Set up your ironing board somewhere with good light, otherwise when you’re out in natural daylight you’ll be horrified to notice all those creases you thought were just shadows. Check the settings on your iron are right for the fabric of your shirt – linen shirts will be thicker and require a higher setting, but make sure you turn down the heat for lighter fabrics like cotton. Start with the collar – unfold it up and iron it on the back first, pressing the iron right out to the point and then on the front, taking care to avoid the buttons (if the shirt has them). After you’re satisfied with the collar, move on the cuffs. The cuffs and collars are generally the parts of your shirt that get the most wear and tear, so spend some time on them. Unbutton the cuffs and iron the inside first. If you can’t avoid the buttons, put a clean tea towel over them to protect them and your iron. Move on to the front of your shirt, and pay particular attention to the shoulders and collar areas – these can be tricky, so if you find you are adding more creases than taking them out, reposition the shirt on your ironing board to make it easier. Again, avoid the buttons on the front of your shirt. Turn the shirt over and position one of the sleeve heads into the square edge of the ironing board to iron half the back in one go, then just slide it over to complete the rest. If you have a back centre box pleat iron around it carefully rather than adding unnecessary creases. Finally – tackle the sleeves. 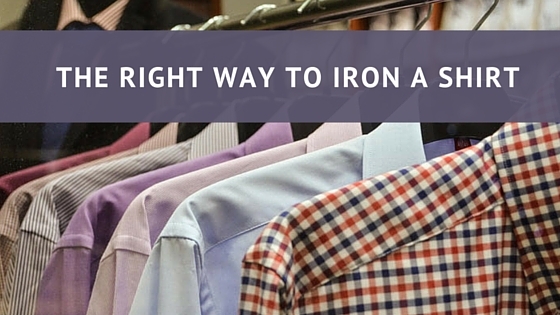 There are some arguments over the right way to iron your shirt sleeves. These can be tricky, so the best thing to do here without a sleeve board (and who has one of those?!) is to try and make the fabric as flat and smooth as possible before you start – use the shirt seam as a guide. This will allow you to iron your shirt with a nice crease along the edge. If you prefer not to have a crease in your shirts, you can roll up a towel and insert it into the arm when you’re ironing to smooth out the creases. Once you’ve finished ironing your shirt, hang it up right away – don’t go undoing all your hard work!